Decluttering :: Can You Make Money Decluttering by Selling Books on Amazon in 2017? Can Amazon be used to further your efforts to declutter and dehoard your home or office? Can it be profitable? Will you get rich off your bookcases? Short answer: probably not. Keep reading to find out other ways to potentially turn your books into cash, or something valuable. Let’s take a look at how individuals can sell books on Amazon. Selling books on Amazon is pretty easy. You download the Amazon Seller app, register an account, and use it to scan your books. They get added to your inventory, and then sold. You may find, however, that you aren’t making money. In fact, you may be losing money. A $0.99 per-item listing fee. This means that you need to have a fairly high sale price before you start making a profit. Look at the table below. The first block of numbers is where you’re likely to be selling. 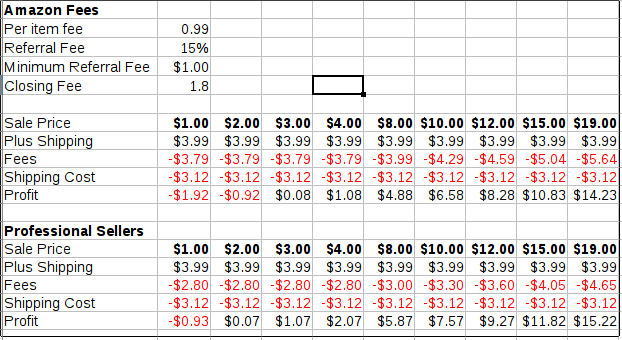 The prices along the top are the sales prices of books, and the bottom row shows your profit at that price. The basic story here: $3 and you break even. That’s ignoring packing materials! More realistically, your break-even price is $4. So, you can sell your book for $4, and you will not lose money. You won’t make money, either. If you have over 40 items to sell, you can pre-pay $40 to Amazon, and your break-even price drops to $3. After you sell 40 items, every item sold has a one dollar profit. It feels great to sell a book for $19. It does not feel great to sell a book for $4! Use the Amazon Seller mobile app to scan your barcodes, and find out prices. List only the ones with a high price, and ignore the rest. When you are scanning, look at the “Amazon Sales Rank”. That’s the book’s rank, with the #1 book selling the most, #2 selling second most, and so forth. If the value is below 100,000, the book will sell, pretty soon. If the value is greater than 500,000, it could take months or years to sell. Amazon will say something is a “slow moving ASIN” if it’s unlikely to sell, and prohibit you from listing. If a book has a rank over 1,000,000, I consider giving the book away. Things that cannot be sold on Amazon can go to a couple other markets. Ebay is the obvious alternative. Ebay charges around $0.25 a listing – though they give 50 free listings to new users. Ebay also charges a final-value fee based on the total price plus shipping costs. So if a book sells for $3, with $3 shipping, the final value fee is $0.60. Net profit here is $2.40. Realistically, the break-even price on Ebay is $2. The fees will be a 50 cent final value fee, and $1 for packaging materials. That leaves a 50 cent profit. The main problem with Ebay is that people aren’t looking for books on there. It’ll take longer to sell. There you go. Sell three for the price of one, and it’ll move. Ebay is pretty good for specialty nonfiction books that may not have an ISBN number, are old, are one of a kind, or otherwise won’t fit into the Amazon system too well. People interested in the subject like “welding” may not be searching for books, but will come across books related to “welding”, and are likely customers. You may still have one in your community. They will pay around 1/3 of resale value, in store credit. You’ll take a box of books in, and they’ll buy some for $9. Whoopee. Lately, though, the bookstores have been so desperate that people are donating books just to help them out. Simbi.com is weird. People don’t pay in money, but in a fake currency called simbi. People do things like tarot readings for simbi. Suppose someone is offering a tarot reading for 15 simbi. Maybe you do a service, like proofread a resume for 15 simbi. You can then turn around and get a tarot reading for 15 simbi. You can now sell used objects on Simbi.com. You can also buy used objects there. There aren’t that many things to buy or sell at the moment, but it’s growing. To really grasp how Simbi can work for you, I think you need to start off by finding someone to provide a service you want or need. Then, you will have established a “value” for simbi, for yourself. Next, you have all these cheap books that you don’t want. Well, you can start to sell the books. When I first started to sell, I was adding shipping — customers need to pay for shipping in dollars, with a credit card. As I started consuming things, though, it started to make sense to consider lowering my shipping fees, or eliminating them altogether. Shipping a book still costs $3, but if you are buying a service that’s worth more than $3 to you, it’s no big deal. As long as that $3 gets you enough simbi to buy $3 worth of something else, life is good. The key here is to consume. Being able to buy things is what gives value to simbi currency. I haven’t really started consuming yet, so I still have postage fees. I’m starting to look, though. Once I have something to buy, and on a regular basis, I can see how mailing out used goods, at a loss, will turn into services, which provide value. I have had no luck selling books on Craigslist. I think people may be successfully selling sets of books. I have been able to give some books away, but even that isn’t easy. The online buyer with the cool name. They pay in the 40c range for books, and also pay for postage. Like Amazon, they have a scanner app to do the intake work and give you a quote. 40 cents isn’t much, but if you have a box with 20 books in it, and they’re all sellable, you’re making $8, and clearing out space.